Kohl’s is offering a coupon that will get you 20% off of your entire order. This can be printed out and used in store or online with a coupon code. 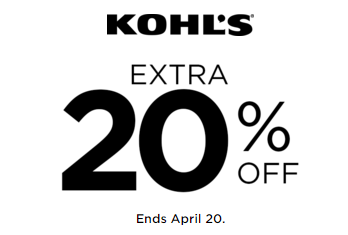 Now through April 20th, you can print this coupon out and head out to Kohl’s to save 20% off your purchase! This can even be used on clearance items. If you prefer to do online shopping instead, this coupon is also valid online at Kohls.com (code SAVENOW).